Looking really nice and I concur with Arthur's comment that the colors are looking natural. thanks everyone. The Silflor static grass I used was 6mm late summer blend, it is straight from the bag. I like the color but I only did a small area, if I had done a large area it would look to even toned and from the work I have seen some do with static grass the key is to have random patches of different tones and length. I have some long 12mm stuff coming today but I am going to try and use the cigar technique that Joey uses to make some taller stuff and then use the 4 and 6mm stuff as well. I have got a rather large area ready for greenery, the hill on the left will be weeds, shrubs, and trees. The area on the right will have to wait a little bit because there will be a water tower that needs to be build, it will go between the turnout and the small hill. I eagerly await the next update. I know the scenery you will do is going to be absolutely first-rate, so cannot wait to see it. I agree. 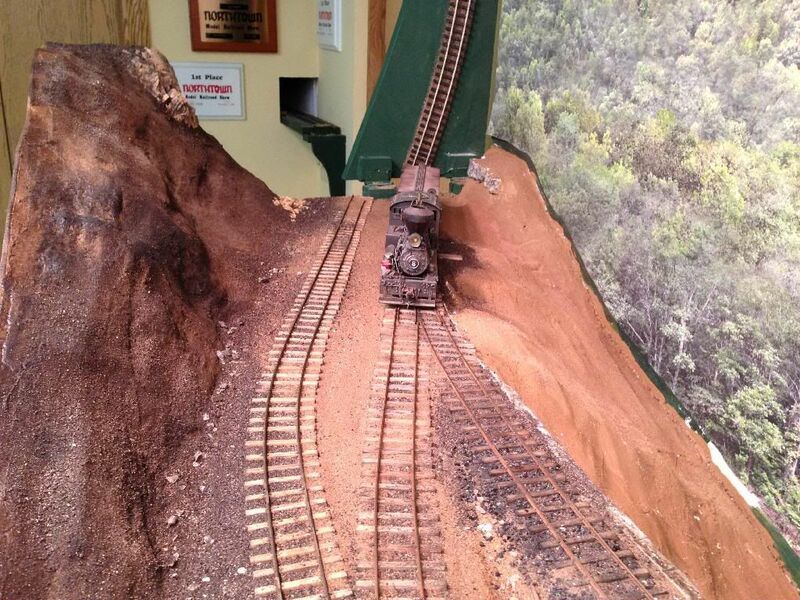 Jeffs scenery was looking great on the HO layout. Am still looking at the photos in the MR article published back in 2010 to get inspired and ideas. This is really the first time Jeff is doing scenery on the O-scale layout. So we all can't wait to see what the reults are. Besides I hope we all realize Jeff is using a $300.00 static grass tool. As handy/crafty/tinkery Jeff is I am actually a little surprised he is using the Noch grassmaster instead of coming up with his own static grass application device. There is a few "how to" - segments on YouTube (HarborFreights fly swatter idea) even I could find. Did build one and tried it. Works pretty well for spending less than $5. Anyway, waiting eagerly for more scenery pictures. By the way, that scratchbuild loco in the pictures looks fabulous with some scenery/buildings around it. Well... Today was not such a good day on the SCRy. I noticed a couple days ago (since I have been doing scenery) that my photo backdrop has some issues, it is bubbled up and pealing off all over. I am sure it has nothing to do with the print but more with my layout environment or the Masonite I attached it to. I had this problem on the HO layout but my prints were small and just printed from my home computer. I was hoping I could just remove the entire print but where it is still attached it is really attached, and the little bit I tried to pull up I tore the backing away a little. I had an idea to inject glue into the bubbles but where I tried I got a wrinkle. It is like the Masonite either shrunk up really bad from the harsh dry winter we are having or the print expanded with the scenery work. I am letting it sit for a while as is to see if it settles out. This is really sad for me because this backdrop has been one of my favorite additions. To cheer myself up I decided to run a drain and dump some coal. I fired up old number 8 and backed up to a string of hoppers, just then the decoder made a loud noise and the sound died, the locomotive still moved but no sound, I pulled the shell and found a bunt spot on the decoder, so my new WOW decoder is fried. I don't know what happened, a few weeks ago it operated fine for hours, today it went about 45 seconds. We all have those days, keep at it! Sorry to hear that. I hope everything works out. I have had the problem of paper backdrop sheets slowly lifting over the years. I finally stopped using them as I never found a good long term solution. As for Masonite, I have campaigned against using Masonite for many years now but anytime I mention my problems with it I hear howls of protest about how great it is. Having lived in Alaska for 45 years, I have experienced extreme changes in humidity as well as temperatures. I have heard that tempered Masonite contains a small amount of oil that causes some of the problems. I learned that I needed to scour the surface with sandpaper before doing anything with it. Otherwise latex paint will eventually pull away from the surface just like your paper has done. I solved my problem by switching to "door skin" which is a very thin, fine grained plywood used to cover interior doors. Sometimes you can fine this at Home Depot or Lowes but often you need to go to a custom door shop to get a sheet of it. Sorry about your misfortunes. Like Darryl, I have stopped using masonite for MRR. Is applying the backdrop directly to the wall, an option for you? Another option is to have the backdrop mounted on foamboard (Michael's does this), but there will be seams, and it's not cheap. Try in a low visibility area putting some parchment paper over the photo and ironing the backdrop. We sometimes have to do this on large decals at my work. The ironing reactivates the adhesives. Don't use the steam setting though it puts moisture into everything. thanks for the tip, I have some cut off scraps that I can test to make sure the iron does not damage the image first. This is an interesting thought, the area that bubbled up really bad is the area at my dump trestle, this is also the area that I have 10 flood lamps aimed at. The flood lamps are all incandescent bulbs and give off a lot of heat, the rest of my layout lights have been converted to LED. I have been doing a lot of scenery work around the dump trestle so I have had the lights on for long periods of time and they are only a few feet from the backdrop. Since I have put up the backdrop I have not had the layout lights on in the room. I wonder if the heat from the lamps has caused the adhesive to come lose. If your iron trick works I am going to convert these lamps to LED and see if that does not solve the issue. Another thing to think about is putting a small pin prick or small slice into any bubbles so that when you press the iron down any trapped air can escape. You could also inject the bubbles with new glue if you have a large hypodermic needle. I have seen this done on our decals too. The needles we use are a pretty good size. They are relics from when we use to inject epoxy into fiber optic connectors, but I'm sure any needle will work if the glue isn't to thick. If you used a contact cement to put the backdrop up, it would indeed be affected by heat. Put a thermometer up against the backdrop when the lights are on. I agree that the smooth side of Masonite can have bonding issues for water-based paints and glues. When I painted the backdrop on my modules, I first white-glued a sheet of artist's canvas over the plywood. It's held up well over 15 years of travel, but for Masonite you might want to do this to the rough side.